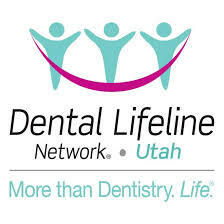 Thanks to the support of the Utah Department of Health, Dental Lifeline Network · Utah was able to help people like Theresa, 64, who lives in Salt Lake City with her daughter. She has experienced two strokes and suffers from seizures, COPD, a thyroid condition, and memory problems. Complicating these medical problems, she hadn’t been to a dentist in more than a decade and her dental health had deteriorated: her upper denture was worn out and cracked, and she had only five remaining bottom teeth which had become broken and decayed. Sadly, Theresa’s teeth caused constant pain, but she was unable to afford the dental treatment she desperately needed. Surviving on a Social Security widow survivor benefit and living in subsidized housing, she and her daughter struggle to make ends meet. Dental treatment seemed like a luxury beyond Theresa’s reach. Thankfully, Dental Lifeline Network was able to help. A generous volunteer dentist extracted Theresa’s remaining teeth, smoothed her jaw bone, and with the help of a volunteer dentist, donated full upper and lower dentures. Thanks to these caring volunteers, Theresa received $4,154 in donated treatment that relieved her pain and restored her dental health!